In 2017, the Samsung Experience Store in the Eaton Centre opened its doors to the public. As indicated by the name, the store presents a unique and innovative form of retail, an all-encompassing experience in which customers could buy and interact with the Samsung products and brand. Some examples include engaging with latest developments, receiving personalized advice, and even participating in various social workshops. The store itself is the ideal one-stop-shop for all tech users, from early to late adopters looking to connect with their devices. With a prime location across from Dundas Square in downtown Toronto the tech giant did not disappoint with their first Canadian Experience store. The busy intersection has been referred to as the “Times Square of Toronto”, which will provide the tech giant with an abundance of foot traffic. 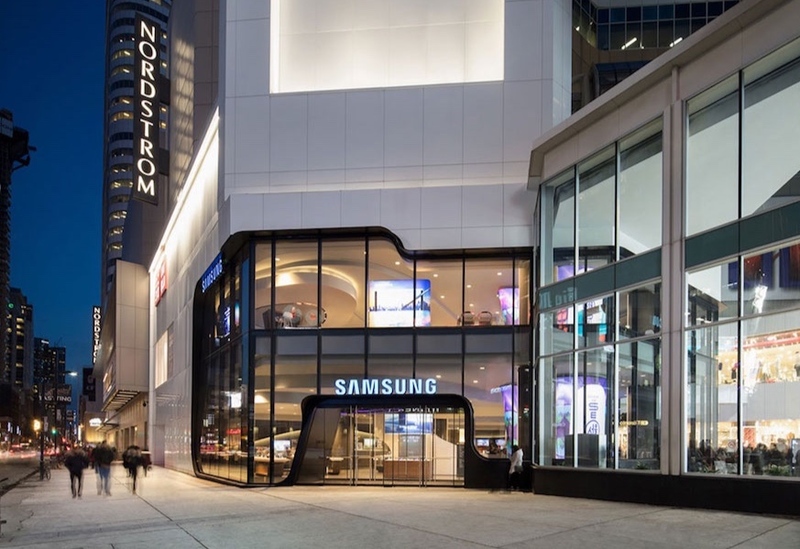 The Design Director of the project, George Foussias from Quadrangle (Toronto), stated that there’s an estimated 25 million people who walk through the square annually, and 8 million people who use the Samsung Experience store entrance into the mall. Architects at Quadrangle wanted to produce a store design that was truly reflective of the Samsung brand so at every touchpoint the customers felt engaged with the company. “Throughout, everything flows harmoniously through the two-story interior; the one word we came to use to anchor the vision was infinity. We kept the scale of everything large, and backgrounds soft and monochromatic to highlight Samsung’s glowing new technologies,” shared Quadrangle’s Design Director, George Foussias. Foussias continued, “Samsung’s Galaxy brand is based on the premise that every product ‘talks’ to everything else, and this inspired us to create an environment that promotes people to connect around shared experiences while discovering how Samsung’s technologies can positively enhance their lives. One detail of the building envelope that aligned the designer’s vision with the Samsung brand was the exterior materials. A sleek and modern façade comprised of glass and aluminum composite material from ALPOLIC brought together the brand persona of being cutting edge, modern, and connective. ALPOLIC’s aluminum composite panels are enriched with Lumiflon FEVE resin, which allow the material to last for extended lengths of time without compromising the store’s futuristic aesthetic. For buildings that face heavy exposure to the elements or are constantly under heavy usage, such as the Samsung Store, finding a coating that is durable and won’t chalk or fade under the pressure of UV radiation, moisture salt or other elemental deterrents is crucial. Lumiflon FEVE resin technology contributes a coating system that not only boasts the designer’s intended aesthetic, but also provides long-lasting protection. Also, they’re dimmable and bankable, so different effects can be created inside and out, day and night. “By day, the main lights on the floor are brightest, so people can see where they’re going,” Foussias explains. “At night, we raise the cove lighting to showcase the space. It’s retail theater.” Cove lights are long strips of LEDs encased in silicone, allowing them to be tucked away and formed in different features of the stores interior design.